It’s Show ‘n Tell Tuesday (even though it’s Thursday, which makes me laugh and laugh), and today, we get to share vicariously in readers photos including Christine’s scrumptious built-in kitchen banquette, above, which came along with her very own time capsule house! Hi Pam! 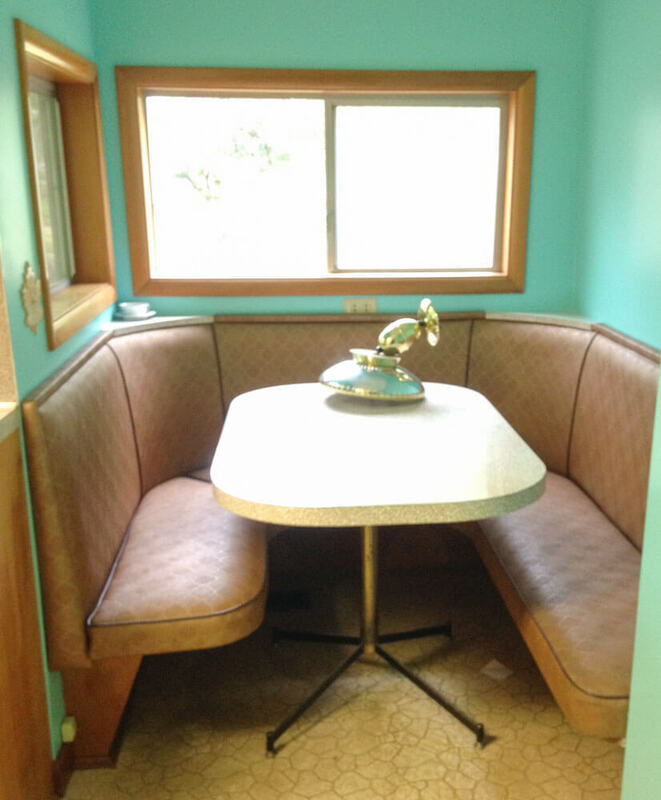 This is a mere one of about a hundred projects going on in my”new” capsule home, and my favorite spot in the house, my banquette! It has the original upholstery, Formica table (which matches the Formica counters in the kitchen) and pull-down light! It’s about mid way through its minor restoration project which included/s wall and ceiling repair, light repair, paint, curtains, and refinishing the original woodwork around the original aluminum windows. Well, five hearts back at ya, Christine. Note, I did remind Christine that we have been told that pull-down lights are no longer to code. So, she is checking with her own licensed professional. Gold star, Christine. Be sure to Be Safe/Renovate Safe, dear readers. 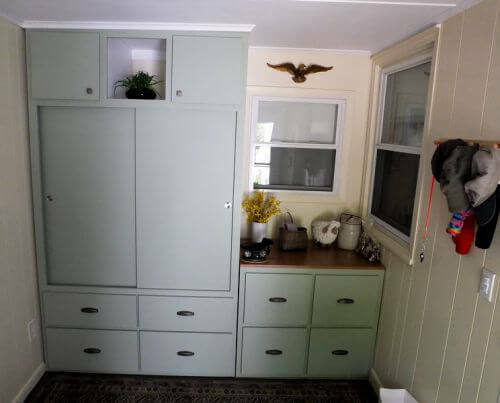 I designed and Bruce built a storage unit that makes our old enclosed breezeway into a nice entryway, complete with coat closet and drawers for everything from scarves and gloves to cat carriers. And it was finished in time for Chad (of Chad’s Crooked House) to come visit us and meet us in person. This is my latest find that I just can’t stop looking at without smiling. I sent a picture of it with all 5 lights turned on. 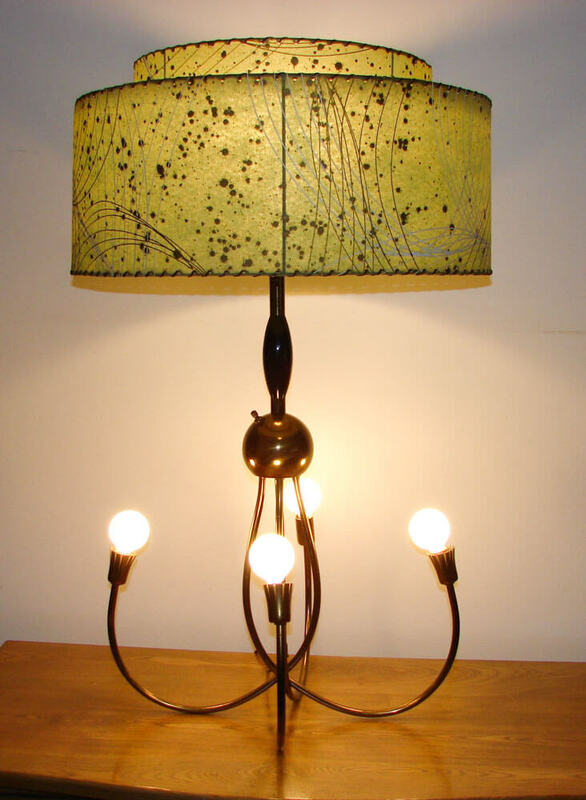 This is a large table lamp that I found at a garage sale recently (we settled on $18). The lady said it had been in her mother’s attic for many years, but it still looks almost new. It is 32″ tall with the base 18″ X 18″. The top has a 3 way switch and the bottom 4 lights are on a separate switch. It has a 2 tier green with white and gold shade, gold color finish, a black section in the center section and 3 of the 4 bottom sockets are split to look like fringe. It’s a great atomic design that I’m excited about and haven’t seen before — but you may have. I love it when I find a cool piece of Mid Century on da’ curb. 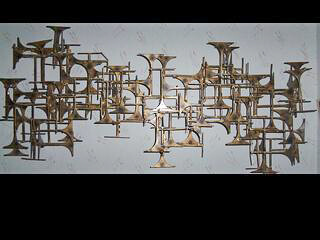 This wall sculpture is by MARC Creates, that I found in the trash of a 60’s ranch home on garbage night. It was rather late, and I happen to be going through a pile of stuff,(forgot my flashlight) and all of a sudden, something “bit me”, I started to unearth the things on top, and…voila! Welcome back Pam! 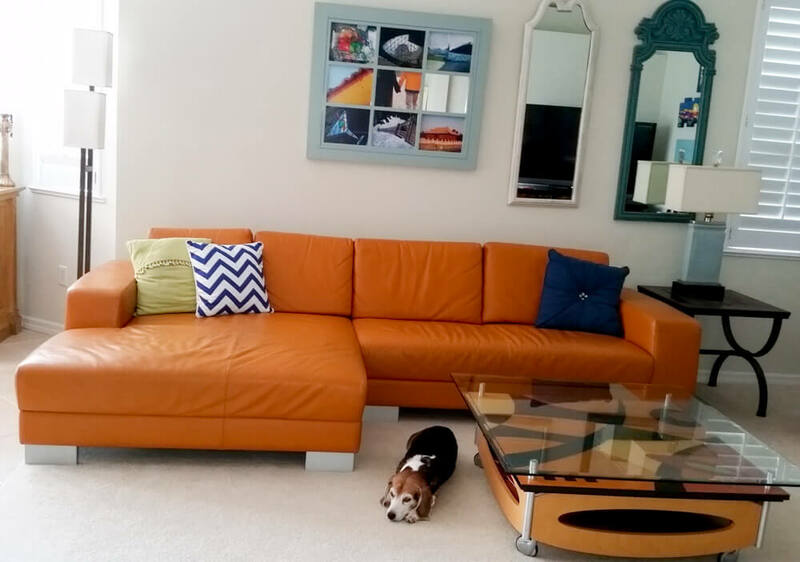 I recently got this honkin’ orange sectional at a consignment store. I don’t know how old it is, but it has the low, clean lines of Mid-century style. It also came with the inlaid wood coffee table. My beagle (a very popular breed in the 50s and 60s) completes the look. We have great consingment stores in Vero Beach and surrounds. I guess because there are so many folks buying vacation places and retiring in the Sunshine State. Also lots of designers and decorators take the “old” stuff to consignment stores when they work their magic for clients. Thanks so much for featuring my Libbey glasses, Pam! I am happy to be included in the company of so many other great items. That orange sectional especially. Fabulous! I forgot to mention that the glasses are circa 1958. They are really fun and interesting. The orange one in the front is Havana. After Fidel Castro came into power and U.S. relations with Cuba deteriorated, Havana was removed from the set and replaced with Nassau. Thanks again, Pam. Retro Renovation is always my first “click” on the computer in the morning. Love it. Thanks for featuring our finds and projects. I always love it when you do that. Every single time I read this blog, I imagine how different things you show us would go in my home or in another RR fan’s home. When I finished looking at today’s features, I pictured a composite room featuring Bette Jean’s fabulous orange sectional and glass and inlaid coffee table (my favorite) with Stacey and Ron’s glassware set on it, Dumpster-Diving Harry’s wall art, and Pam’s five-bulb lamp on the side table! Wouldn’t that be neat-o? 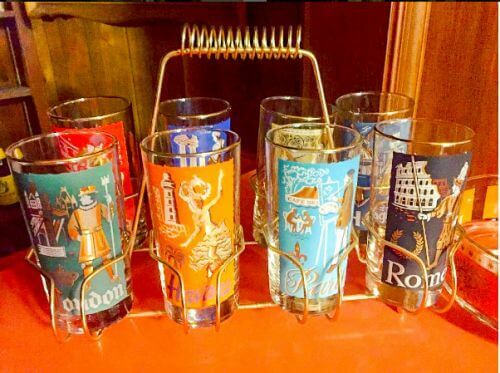 Oh, and I remember those drinking glass sets from the 1950s and early sixties. Besides the international cities there were other patterns (I remember a French set in black, pink and white, with a poodle, the Eiffel tower, etc. ), but all were in the gold-colored or black wire caddy, some with the curled wire at the top, some with a wooden handle. I forgot to mention that Christine’s pull-down lamp that no longer meets code can be rewired by an electrician, including all the original elements but reconfigured so that it hangs at the fixed height Christine wants for her space. I have seen that done. Also, in the renovate safe category, the electrician will know the correct junction box to use for a hanging fixture. I want them all ! I need a bigger house. Oooo, I’d sure like to see Pam’s lamp lit in every way it can be.